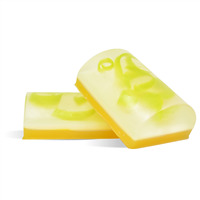 Lemongrass and Sage - the suble hint of herbal, mint and citrus notes create a fresh spa feeling! To a microwave-safe measuring cup, add 4 oz. of cut up Crystal Clear Soap Base. Heat in microwave until soap has melted. Cut a sliver off of the Matte Woodland Green Soap Color Cube and a sliver off of the Matte Yellow Soap Color Cube. Add to melted soap and stir until melted. The soap should be a sage/olive green color. If necessary, add a little more green or yellow to the soap. If color has not completely melted, heat briefly in microwave until melted. Pour into one cavity of the Euro Silicone Mold and let soap harden. Using a vegetable peeler, peel off slices of "grass" of various sizes and set aside on a cookie sheet. In a plastic beaker, mix together 6 ml of Lemongrass Sage Fragrance Oil and 6 ml of Vanilla Color Stabiizer-MP Soap. Stir and set aside. To microwave-safe measuring cup, add 8 oz. of cut up Crystal Clear Soap. Heat in microwave until melted. Add the fragrance/stabilizer mixture and blend in. When the soap temperature is at or below 130°F, pour soap into each cavity to the top of the curved area (where the mold becomes straight). Immediately, spritz some green soap shavings with alcohol and drop some into each soap cavity. Spritz tops of the soap with alcohol and let soap harden. To microwave-safe measuring cup, add 4 oz. of Crystal Clear Soap and heat in microwave until soap has melted. 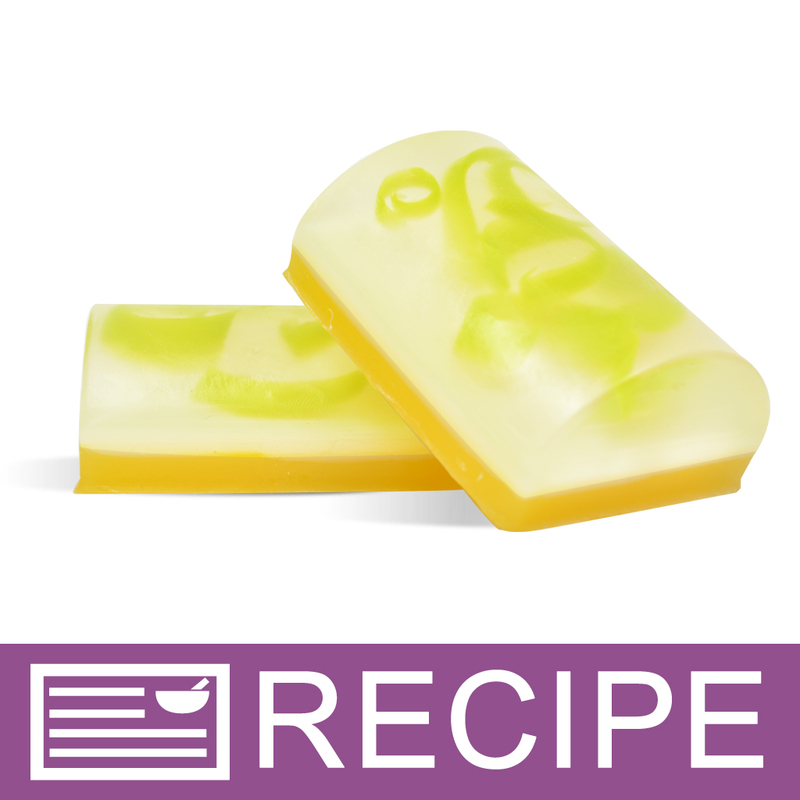 Add 25 drops of Matte White Liquid color to the soap and mix well. When the soap temperature has cooled to 125°F, spritz top of clear soap with alcohol and pour a thin layer of white soap into each cavity. Spritz again and let soap harden. In a plastic beaker, mix 6 ml of Lemongrass Sage Fragrance Oil and 6 ml of Vanilla Color Stabilizer-MP Soap. Stir well and set aside. To microwave-safe measuring cup, add 4.10 oz. cut up soap and a small sliver of the Matte Yellow Soap Color cube. Heat in microwave until melted. Add more color if soap is not a golden color. Add the fragrance/stabilizer mixture to the melted soap and stir. 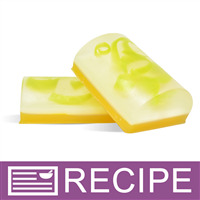 When soap temperature cools to 125°F or less, spritz each mold cavity with alcohol and then fill the molds the rest of the way with the golden soap. Spritz tops with alcohol and let soap harden. Remove soaps from mold once soap has completely set up. Wrap each bar tightly with plastic wrap or another type of airtight packaging. Ingredient Label: Sorbitol, Propylene Glycol, Water, Sodium Stearate, Sodium Laureth Sulfate, Sodium Myristate, Sodium Cocoyl Isethionate, Glycerin, Fragrance, Triethanolamine, Chromium Oxide, Iron Oxides, Titanium Dioxide. "For what ingredient is the vanilla color stabilizer needed?" Staff Answer There can be other ingredients in a fragrance oil besides vanilla that can make a MP soap bar change color or darken. The author of this recipe wanted to keep the colors true so used the stabilizer as a precaution.